The Prestigious Star Awards Grand Ball took place on Friday evening at One Whitehall Place in London to celebrate the world’s best venues. In an evening that fizzed with energy, guests enjoyed captivating performances, glamorous dance troupes, enchanting foot jugglers, glittering musicians and ballroom dancing. London’s Grand Ball revived the elegant and timeless art of the ballroom dance in one of London's most beautiful ballrooms. Performing arts company City Academy gracefully demonstrated traditional ballroom dancing, which added a touch of magic to this opulent Ball. During the awards presentation, the 2019 winners were announced and winning venues included Palazzo Versace Dubai (UAE), Blenheim Palace (UK), Su Gologone (Italy), Hôtel Majestic Barriere (France), Unico 20 87 (Mexico), Hard Rock Hotel Davos (Switzerland), and more. The ‘World’s Best Events’ section of the evening was a showcase of exceptional events, selected among over 200 outstanding submissions, hosted at notable international venues including Lord’s Cricket Ground, Brocket Hall and Hotel Villa Diodoro. The winner was selected through a live audience vote that took place on the night. Hotel Villa Diodoro in Sicily enjoyed a decisive victory to win the 'World’s Best Event' trophy. The Prestigious Star Awards program celebrates the quality, performance and reputation of the world’s best venues qualified to host the most memorable events. It remains, the only global luxury venue recognition programme across the industry. 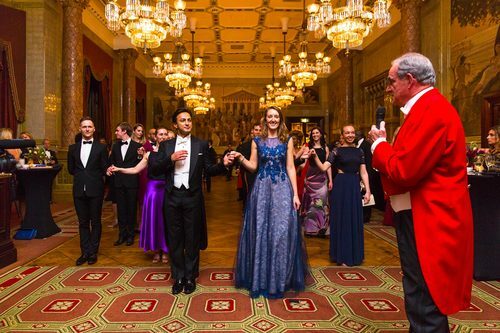 Building on the spectacular success of last year, guests at London's 2019 Grand Ball enjoyed a star-studded night filled with energy, captivating performances, glamorous dance troupes, enchanting foot jugglers, glittering musicians and ballroom dancing. The evening brought together distinguished individuals from the Prestigious Venues network, including senior representatives from leading international venues, corporate partners, prestigious event suppliers, and VIPs from a wide range of sectors. In spectacular style, the evening revived the old-world tradition of ballroom dancing to classical ballroom pieces including Shostakovich’s Waltz No. 2. Set in motion by City Academy, this element of the awards evening was thoroughly enjoyed by all. Over the course of the evening, five lucky guests also won luxury weekend stays at some of the world’s most prestigious hotels. Event partners included One Whitehall Place, Yellow Entertainment, Eclipse AV, Rupa Photography, Richard Birtchnell, Sportography, City Academy, and Libertine. This press release was distributed by ResponseSource Press Release Wire on behalf of Prestigious Venues Ltd in the following categories: Entertainment & Arts, Business & Finance, Travel, for more information visit https://pressreleasewire.responsesource.com/about.